Watching: This show never gets old and just gets funnier every time I watch it. 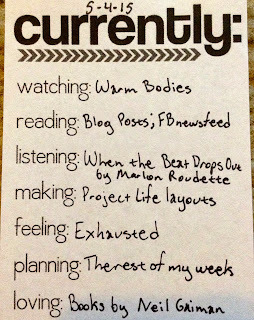 Reading: I had a lot of blog posts that I read today. Listening: The beat on this song is awesome! Making: I am finishing some layouts and working on some cards using my Freckled Fawn kits. 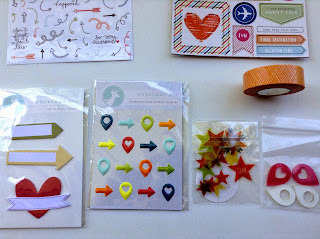 I also will be making some projects using the new Fine and Dandy core kit and the September Skies core kit. Feeling: I'm finally going to take some driving lessons and I'm feeling excited, hopeful, and anxious. I'm hoping that taking a few lessons will decrease my fear of driving. 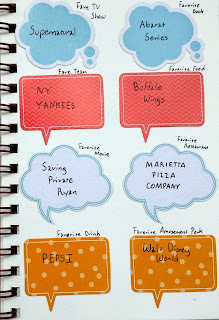 Planning: We are finally having a vacation (or rather a staycation) and we are so excited! 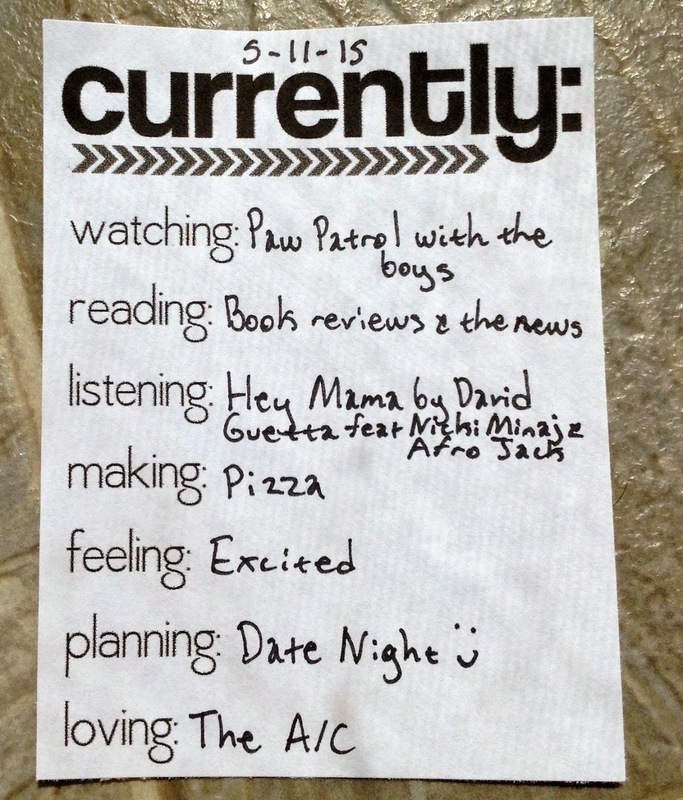 We will probably go to some amusement parks, movies, zoo, and maybe the aquarium. Loving: I'm really glad that I got to try Weight Watchers Ice Cream because it really is good. 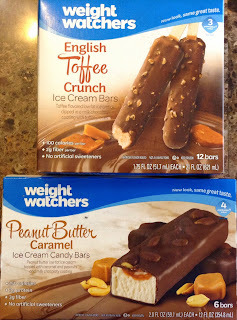 I need to try some other flavors of Weight Watchers ice cream. Happy Monday everyone! I hope everyone is enjoying their Memorial Day and I hope everyone is remembering those who made the ultimate sacrifice for this country. Today, I wanted to share a quote that I saw on one of my journaling cards from Mambi's Story of Me pocket pages. I really love this quote a lot. This journaling card needs to be put in a layout or mini album soon. 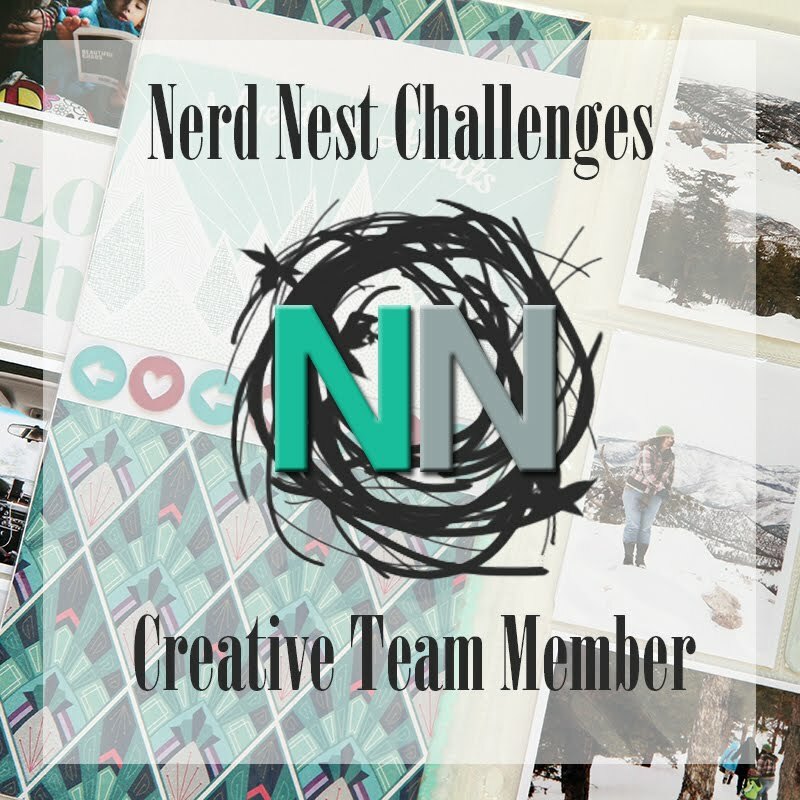 I plan to post a new quote every Monday and will post a link of where I found the journaling card/Project Life card as well. What are some of your favorite quotes? Please feel free to share in the comments section! Happy Sunday! I hope you are all enjoying your weekend so far. Yesterday, I was finally able to get some new Project Life core kits. I kept wondering whether or not I should get a core kit since I have enough Project Life cards as it is. However, after watching some Youtube videos of the September Skies core kit and the Fine and Dandy core kit, I decided I would get at least one. My local Hobby Lobby still doesn't have any of the core kits on shelves so I ended up going to a different one. After my second trip there (that's a totally different story to tell...on a different day), I decided to just get both of the kits so I wouldn't make another trip! Ok so enough of my rambling...on to the good stuff! This kit was designed by Heidi Swapp. She actually made a few other products in this collection before making the core kit and value kit. I love this core kit a lot! I'm not a big fan of florals, but this collections has a nice mix of florals, glitter, and colors. I mainly purchased this card due to a few of the cards such as the ones with the constellations, lightbulbs, plus signs, and a few of the glitter cards. Once I saw all of the cards, I knew I made a good decision in purchasing this kit. I also love this core kit a lot. I can't decide whether I like this kit more or September Skies. They are both equally awesome and have gorgeous cards! This kit seems like it is party/Happy Birthday themed, but you can totally use the cards for other themes and purposes than just documenting a birthday celebration. My favorite cards in this core kit are the the glitter cards like the ones with the ice cream cones, hearts and polka dots. 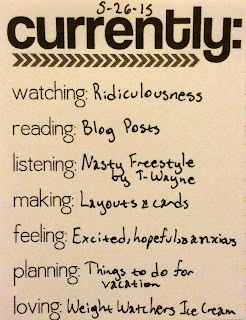 I also like the currently cards, numbered lists journaling cards, and the cards with the quotes. Overall, I am really glad that I purchased these two core kits. 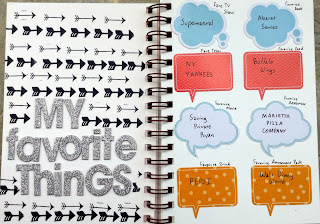 I plan to use them in other projects besides my Project Life album and semi traditional (hybrid?) layouts. These cards would be perfect for when I make greeting cards, mini albums, and home decor. 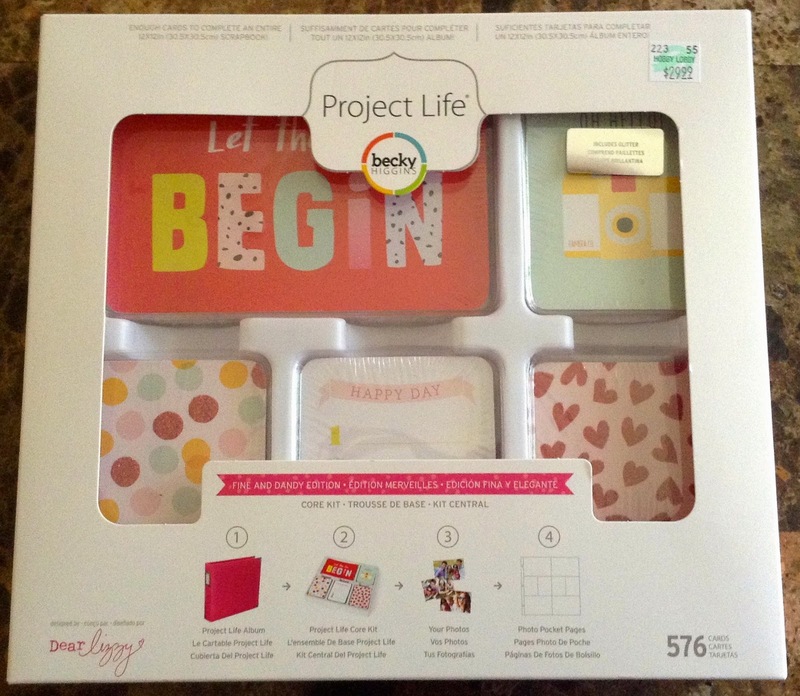 Have you purchased any of the new Project Life core kits? Which ones did you get? Feel free to share your opinion. Hey! Hey! Happy Friday everyone! A few days ago, I received two coupons from Influenster for some Weight Watchers Ice Cream! I was so excited to get these coupons because I love ice cream. I mean who doesn't like ice cream? 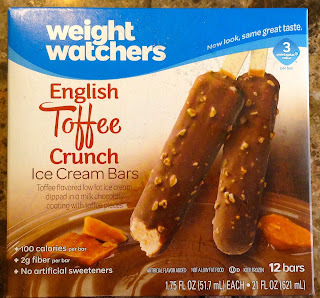 I have never tried an ice cream product by Weight Watchers (or any of their products actually) so I was really interested in finding out how these would taste. I always assumed that any product by a company that specializes in weight loss products had to have a different taste in their foods. Oh how I was so wrong! When I got to the store, I didn't really know which ice cream I should get. 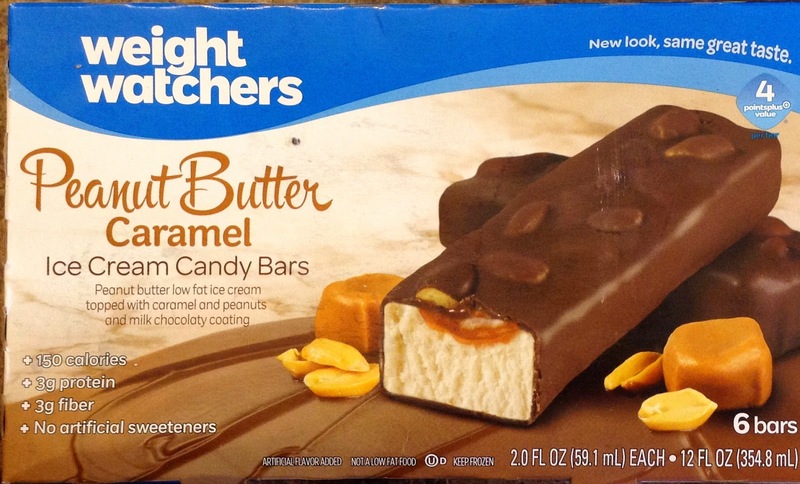 Eventually, I decided on the English Toffee Crunch Ice Cream Bars and the Peanut Butter Caramel Ice Cream Candy Bars. I love that there were so many different kinds of ice cream and frozen yogurt bars to choose from. The English Toffee Crunch Ice Cream Bars were my absolute favorite! They were so sweet and delicious! They also didn't taste weird at all and they are low in calories which is awesome! The Peanut Butter Caramel Ice Cream Candy Bars were also really good. I loved the peanuts and the caramel. They were all sweet and really did taste like a candy bar. I would definitely recommend these two flavors of ice cream especially the English Toffee Crunch Ice Cream Bars. I plan to try the other ice cream products and may even try some of the Weight Watchers meals. Have you tried any Weight Watchers ice cream products? Which ones are your favorite? Watching: I love this movie! It's an oldie, but a goodie. My older sister and I used to watch this movie all the time when we were younger. 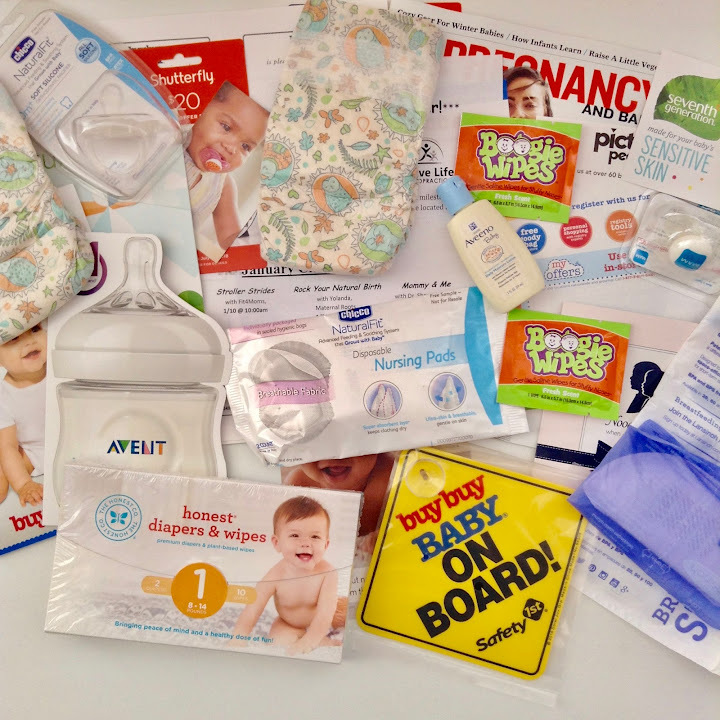 Reading: I have been wanting to get some new receipes to try out and decided to buy the Food Network Magazine and Everyday with Rachael Ray magazine. There are some really good recipes in there and I can't wait to try a couple of them. Listening: This song is awesome! Tori Kelly has an amazing voice. 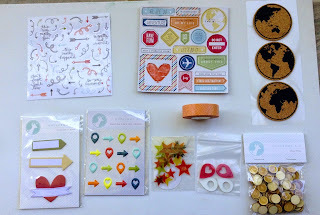 Making: I have been working on some layouts using Freckled Fawn's May 2015 kit. 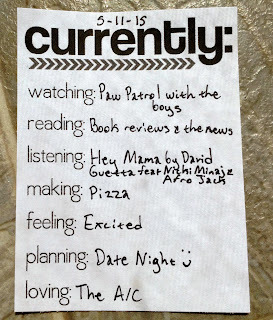 Feeling: It's been a super busy day with errands, to dos, and a class party for the boys. I'm exhausted, but it's been a great day. 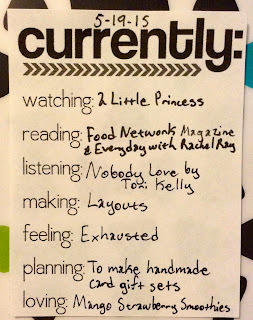 Planning: I want to make some handmade card gift sets using some of my Project Life cards, but I don't even really know where to begin. I think I might check out Pinterest to get some ideas and inspirations. Loving: I haven't been to Smoothie King in a long time and have been craving a smoothie for a while now. I was excited when I saw that there was a Smoothie King (in a mall I don't usually go to) and bought a Mango Strawberry Smoothie. It was delicious! 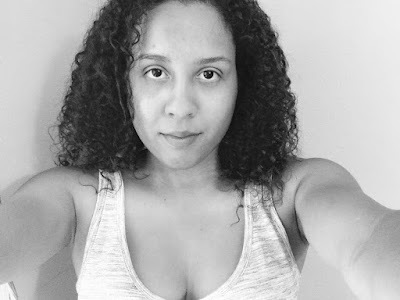 A few weeks ago (possibly a month ago), I signed up for Blogging for Books. You can find more information on blogging for books here. I received my first book a few weeks ago and have finally finished it. The book I chose to review is A Fifty-Year Silence by Miranda Richmond Mouillot. The World War II era has always fascinated me which is why I chose to read A Fifty-Year Silence. This book is about the narrator trying to find out why her grandparents were estranged and never spoke or saw each other again. I completely understood why the author wanted to find out what happened with her grandparents because honestly who wouldn't want to know. The book did read somewhat like a diary and it was clear that the author did the best she could to piece the story together despite her grandparents not giving her much information. The book would jump back and forth from the past and present because the author was trying to get as much information as possible regarding her grandparents. I would have preferred that Mouillot had written the book after getting all of the information (or as much as possible) rather than having the book jump back and forth. I also would have preferred that the story would have been more about her grandparent's lives rather than her own although I think the book may have been written the way it was due to the information that the author received. I don't want to give much of the story away, but I was disappointed and sad with the ending. I would recommend that people read this book because it was interesting. 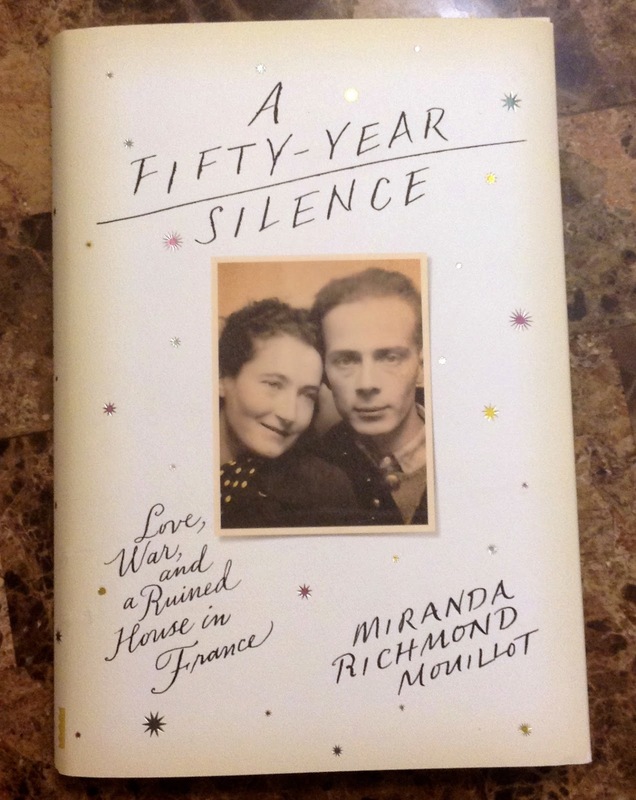 Have you read A Fifty-Year Silence? What are your thoughts on the book? Hello there and Happy Friday! A few days ago, I finally received my Freckled Fawn kit. I am really loving this subscription and plan to keep it for a while. This month's kit is absolutely amazing! I say that every month, but it really is amazing! The new kit is travel themed and is perfect for documenting trips. 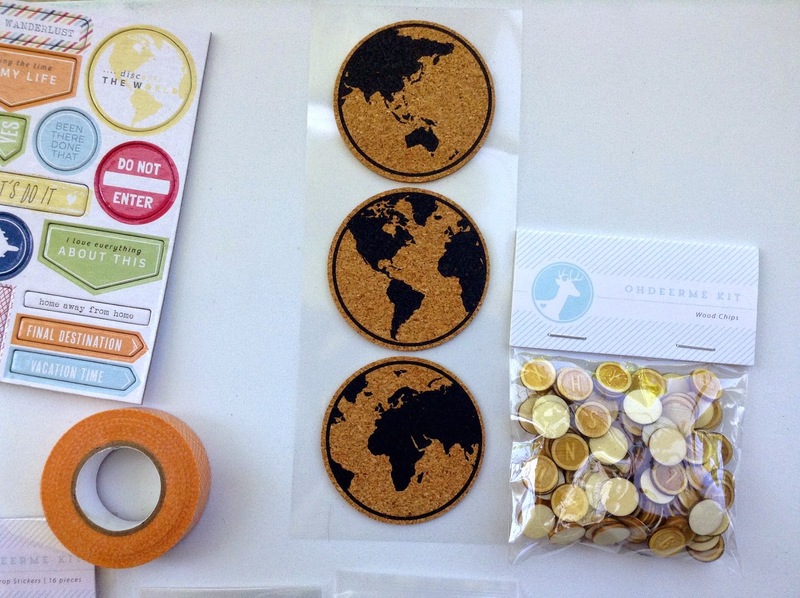 My favorite items in the kit are the enamel shapes, chipboard stickers, clear arrow stickers, and the printed cork globe stickers. The chipboard stickers and the clear arrow stickers are awesome! I actually am considering ordering another kit just for the stickers and enamel shapes. 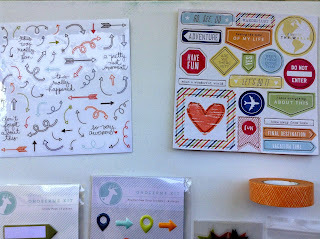 I am a sucker for stationery products and I am loving the sticky notepads. I also like the glitter resin geotags, but I wonder how I would glue them down. I don't use a lot of clear products, but I am excited to use the transparency stickers as well as the clear arrow stickers. The roll of washi tape is really thick which is really awesome. Can we please just take a moment and just stare at those cork globe stickers! I love, love, love these! 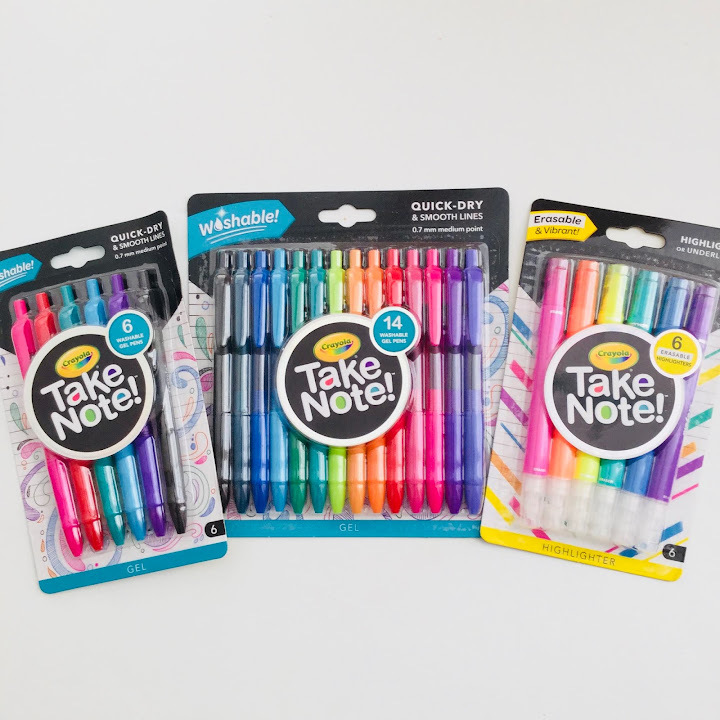 I have a feeling that I am going to want to hoard these, but I may end up buying some extra ones in Freckled Fawn's shop. I really like the alphabet wood circles and love that there is a decent amount of them. I really can't wait to use this kit on some projects. I plan to post some of the projects that I will make using this kit in the next few days so be on the lookout for that. Do you subscribe to Freckled Fawn or any other papercraft/crafting subscription box? Feel free to share. Watching: I'm so glad that we are watching Paw Patrol and not Big Hero 6. The boys watch that movie everyday...no seriously...everyday. I always hear my friends say that their daughters watch Frozen everyday which I'm so glad that the boys don't care for that movie. I'd rather watch Big Hero 6 instead of Frozen, but I was super surprised that the boys wanted to Paw Patrol. Reading: There are several books that I want to read so decide to check out some book reviews. I usually don't read book reviews because I just pick the book that I want to read based on the cover as well as the synopsis that is on the back cover. There's been a lot of interesting stuff on the news lately as well as both good and bad things of course. Listening: I love this song. I love the collaboration! Making: The kids wanted pizza so I decided we'd have pizza for dinner. Feeling: I have a lot of great plans for the next few weeks! Planning: My husband is dying to see the new Avengers movie so we decided to have a date night tomorrow (technically today since it's Tuesday). Loving: It has been way too hot lately so I am loving my A/C. Hi there! Today I want to share some information on the MyDetails workshop as well as my take on the first prompt. You may remember that I mentioned this workshop a couple of times before. 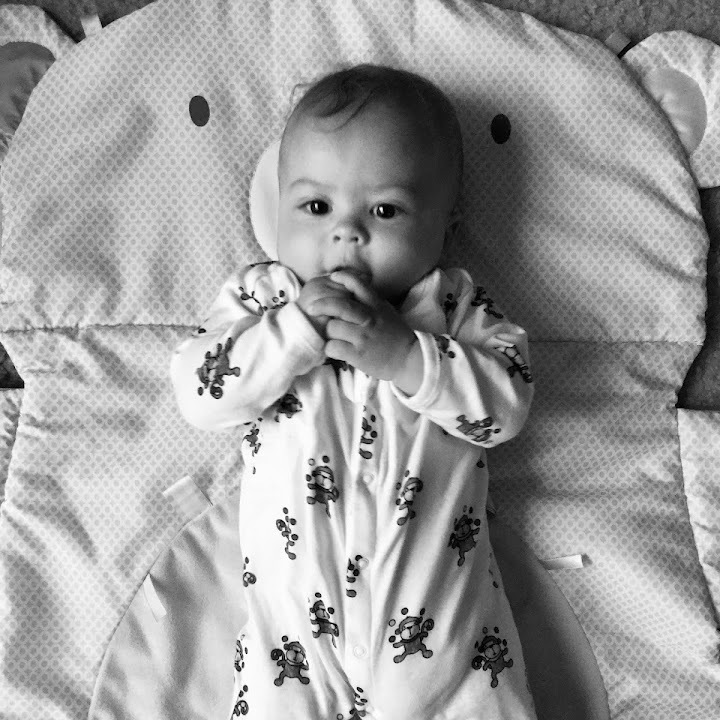 I even blogged about my experience which you can read over here. The purpose of the workshop is to document things about yourself. A prompt is provided every couple of days and there is no right or wrong way to complete the prompt. I love that there are so many ways that you can interpret the MyDetails prompts. 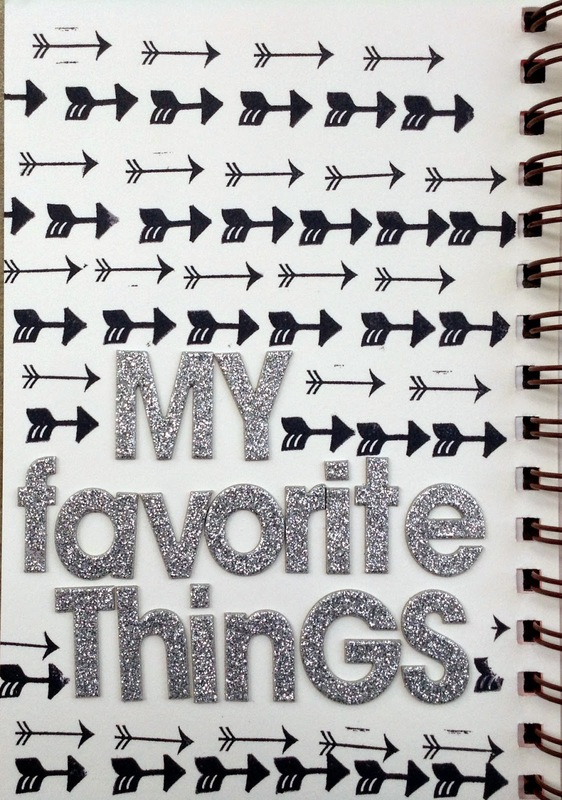 The first prompt is Favorite Things. I did a two page spread with the title and then my responses on separate pages. 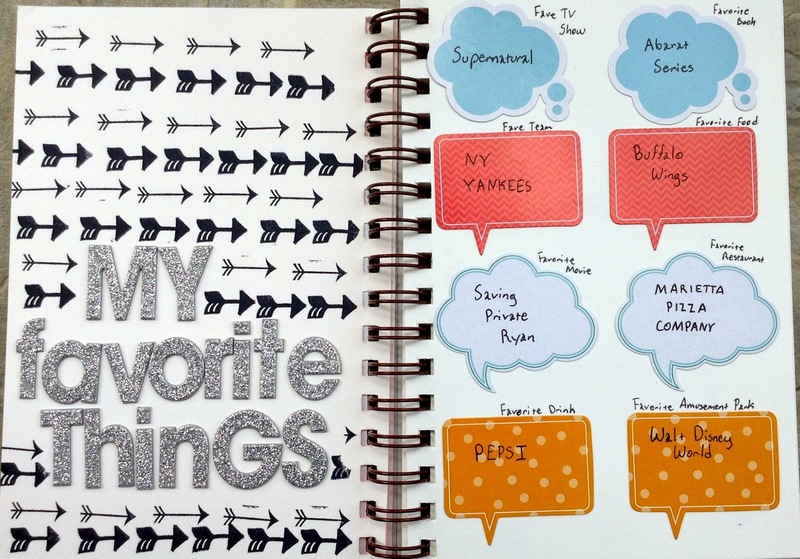 I chose to just document a few of my top favorite things such as my favorite tv show, favorite book, etc. 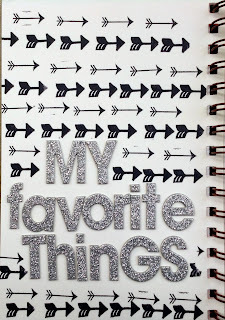 For my first page, I used my Rukristin arrow stamp and some silver glitter Mambi alpha chips. I just stamped all over the page and around the alpha chips. I wrote down different categories using my Sharpie pen. 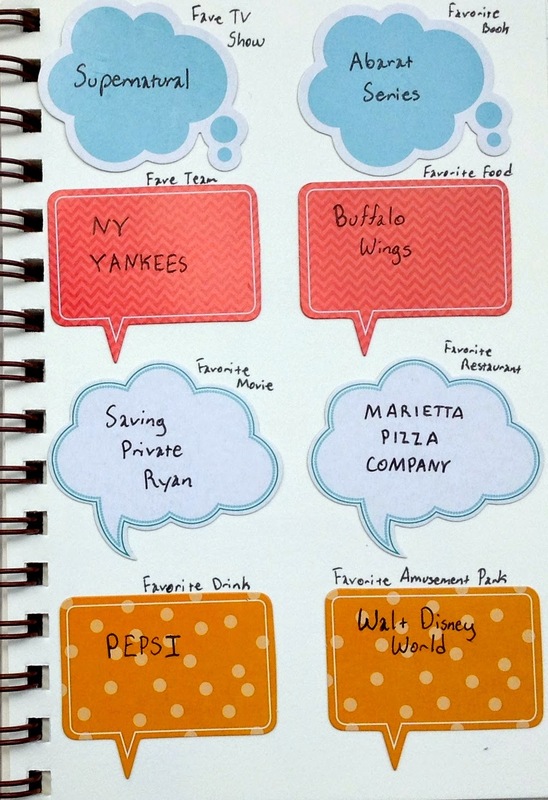 Then I used some speech bubbles and wrote down my responses. Are you participating in MyDetails? If you want to enroll in the class click here. Watching: This movie is hilarious! I've watched it twice already and may just watch again sometime this week. 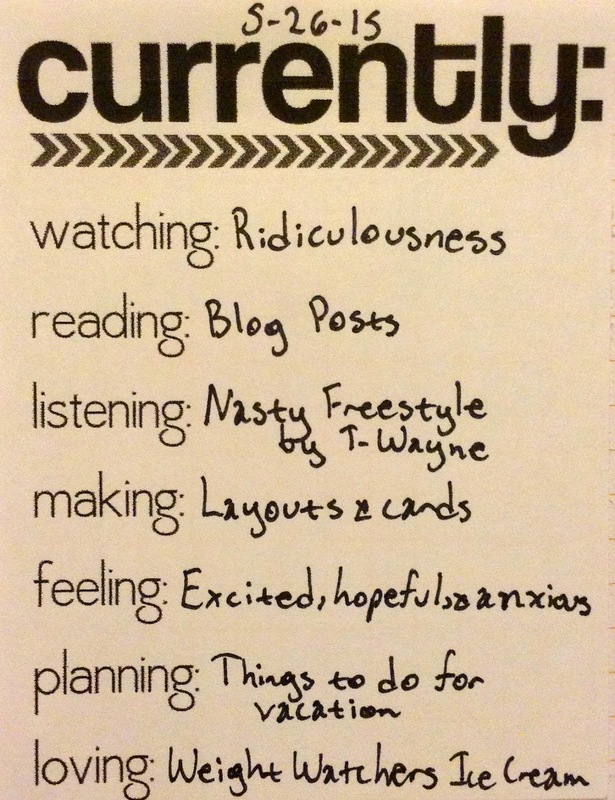 Reading: I had a ton of blog posts to read since I didn't get to read much over the weekend. My Facebook newsfeed was also interesting and the memes that were being posted (about the Mayweather vs Pacquiao) was just hilarious. Listening: I love this song sooooo much! I've been listening to it on repeat. 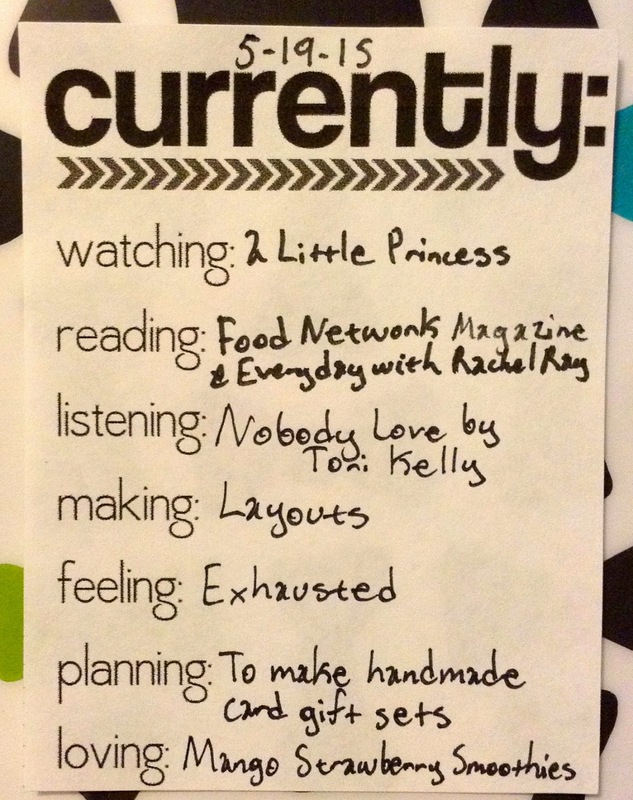 Making: I'm almost caught up with my Project Life layout and I also plan to make a traditional layout as well. Feeling: I've been feeling really exhausted lately. I definitely need more rest. 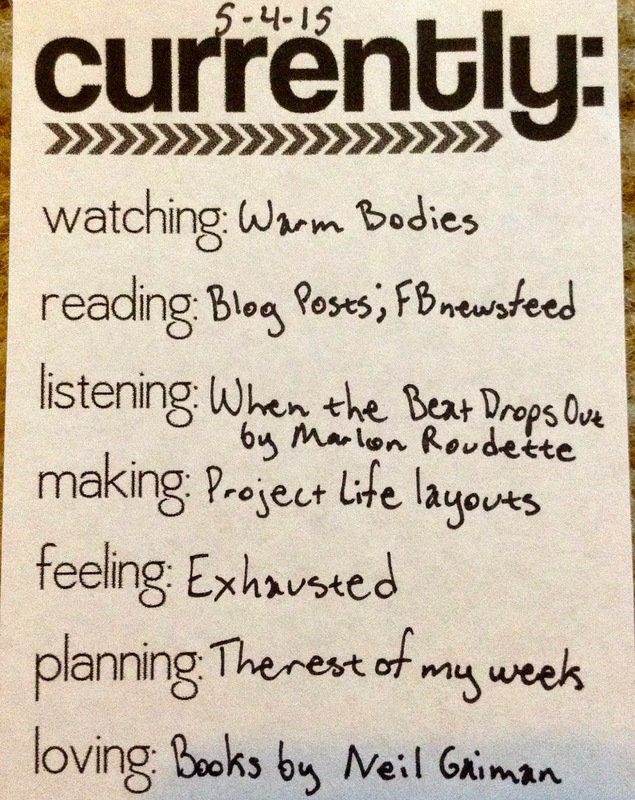 Planning: I need to adjust my schedule for the week so that I can be as organized as possible and not stress out. I also need to stop procrastinating as well, but I know I've been doing that because I've been exhausted. Loving: I bought three more books by Neil Gaiman and I can't wait to pick which one to read. I bought Good Omens, Neverwhere, and Coraline. I also need to read The Graveyard Book again because I never got to finish the book when I first started reading it. Happy National Scrapbook Day! Today's post is coming a little bit late because we were out celebrating my son's birthday. I actually made a layout yesterday since I knew that I wouldn't be able to craft much today. 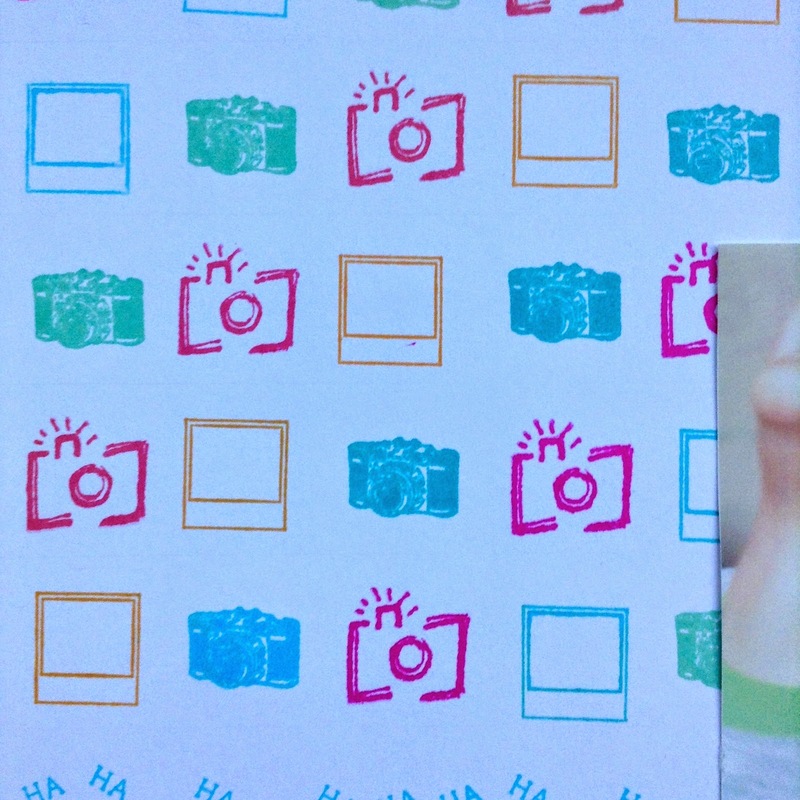 I was inspired to use stamps as my background from a layout I found on Evalicious blog. You can see the layout that inspired me here. I started my layout by stamping the images onto my cardstock. It didn't take too long, but I did have to make sure that I matched the colors in a pattern. I did have a few "oops", but they are minor so I decided not to stress out about it. After i stamped the images, I laid down the picture in order to see where I would like to glue it down. Once I figured out where to put the picture, I glued it down. 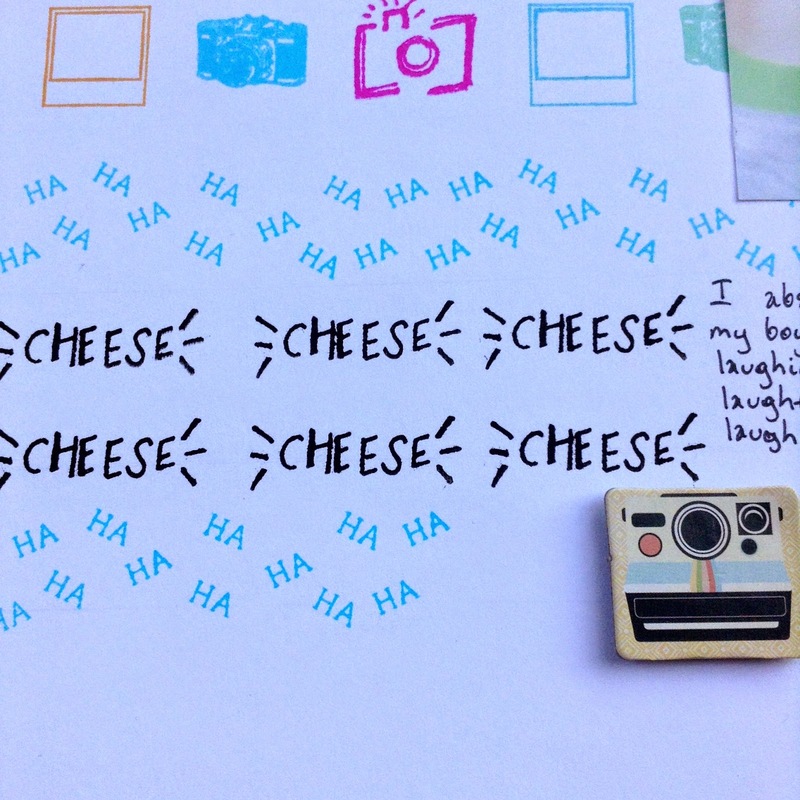 Then I added some journaling and decided to add the "Cheese" and "HA HA HA" stamps onto my layout. I also added some buttons. Below are some close ups of the layout. Thanks for stopping by. 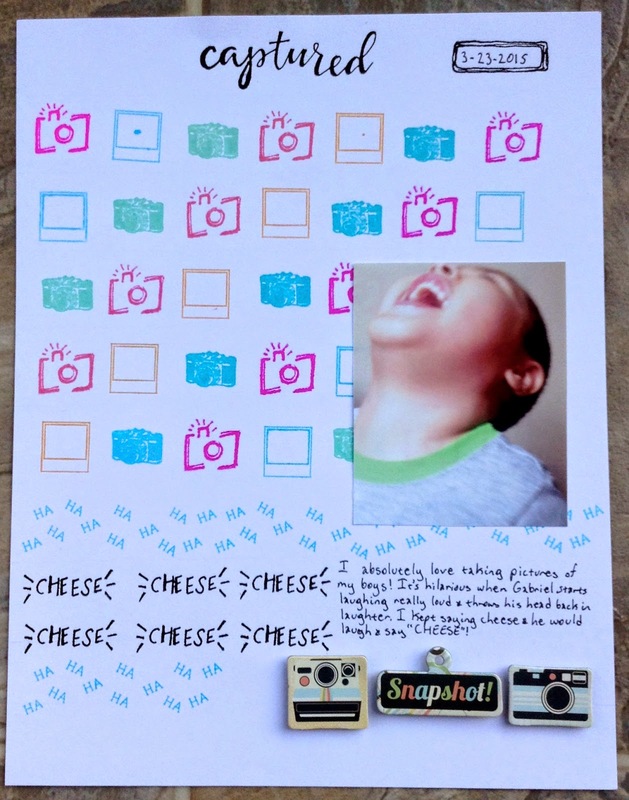 What did you make for National Scrapbooking Day? 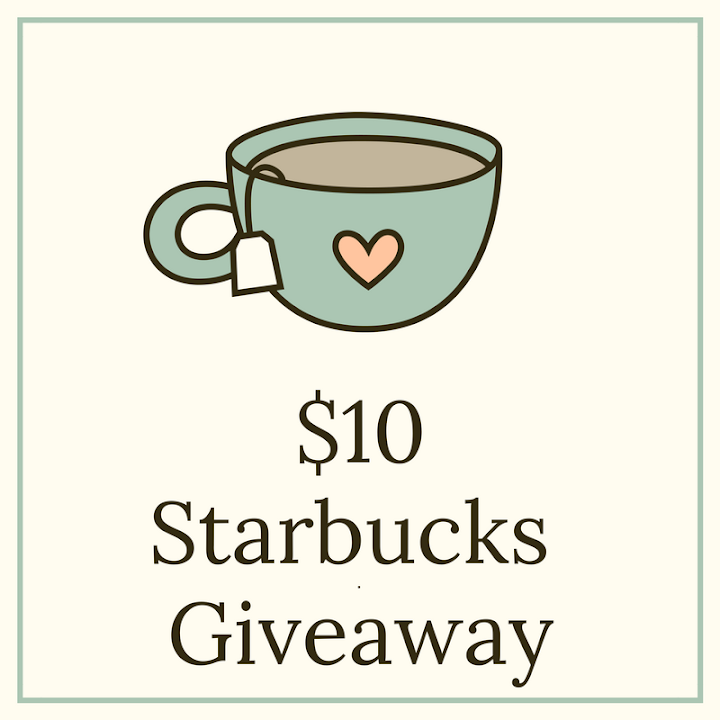 Feel free to share!